What happens when nuclei can move as fast as electrons? Understanding the dynamics of quantum mechanical systems on their natural time scale is the main goal in attosecond science. In particular molecules represent one of the most interesting systems to investigate due to their intrinsic high degree of complexity [1-4]. So far, the few existing attosecond experiments performed on molecules have allowed one to study electron dynamics decoupled from nuclear dynamics by assuming that the nuclei move much slower than electrons [2,3]. Therefore the former can be considered as “frozen in their original positions” while the fast electron dynamics evolve. However, even in the attosecond time regime, this approximation is usually inappropriate. In molecules composed of light atomic species like hydrogen, the nuclear motion can be as fast as electron dynamics, resulting in a strong coupling between them [5-8]. Cattaneo et al. addressed the question of what happens when nuclear motion operates on the same time scale as electronic motion in the lightest and smallest of all molecules, H2. They benefit from a full coincidence detection scheme , implemented here to perform attosecond measurements (see Fig. 1a), and nearly exact ab initio theory to describe both electronic and nuclear motions, as well the coupling between them, thus providing a stronger support to their conclusions. The present work shows for the first time that ionization delays in molecules can significantly depend on both photoelectron kinetic energy and the nuclear kinetic energy (see Fig. 1b), extending the concept of ionization delays introduced for atomic systems. Variations of ionization delays with the nuclear kinetic energy can be as large as variations with the electron kinetic energy (see colorbars in Fig. 1b), which implies that whenever light atoms are involved in the molecular ionization process, the outgoing electron wave packet cannot be disentangled from the nuclear wave packet. The impact of this work goes well beyond the simple H2 molecule because H atoms are present in most organic and biologically relevant molecules. Thus, understanding the effects and contributions from coupled electron and nuclear dynamics present in such systems is of fundamental importance in many fields of research. Fig. 1. a) Sketch of the AttoCOLTRIMS apparatus  consisting of a cold target recoil ion momentum spectroscopy (COLTRIMS) detector allowing for the detection of the 3D vector momenta of electrons (blue elliptical arrow) and ions (H2+ and H+, grey arrows) in coincidence; and the combination of an extreme-ultraviolet (XUV, blue) and a long and rather weak infrared (IR, red) pulse in a pump-probe set-up. b) 3D map of the experimental extracted phases Df (3D surface, in radiants) accumulated by the escaping photoelectrons and corresponding time delay Dt (2D projection at the bottom, in attoseconds) for a specific molecular orientation, as a function of both the nuclear kinetic energy, or kinetic energy release (KER) and the electron kinetic energy. Phases and time delays are expressed with two different colorbars. G. Sansone, F. Kelkensberg, J. F. Pérez-Torres, F. Morales, et al. Nature 465, 763-766 (2010). S. Haessler, et al., “Phase-resolved attosecond near-threshold photoionization of molecular nitrogen,“ Phys. Rev. A 80, 011404 (2009). M. Huppert, et al., “Attosecond delays in molecular photoionization,“ Phys. Rev. Lett. 117, 093001 (2016). P. Hockett, et al., “Time delay in molecular photoionization,” J. Phys. B: At. Mol. Opt. 49, 095602 (2016). A. D. Bandrauk, S. Chelkowski, S. and H. S. Nguyen, “Attosecond localization of electrons in molecules,” Int. J. Quant. Chem. 100, 834-844 (2004). C. R.Calvert , et al., “Time-resolved studies of ultrafast wavepacket dynamics in hydrogen molecules,” Phys. Rep. 491, 1-28 (2010). M. Lara-Astiaso, et al., “Decoherence, control and attosecond probing of XUV-induced charge migration in biomolecules. A theoretical outlook. Faraday Discuss,” 194, 41-59 (2016). M. Vacher, et al., “Electron Dynamics upon Ionization of Polyatomic Molecules: Coupling to Quantum Nuclear Motion and Decoherence,” Phys. Rev. Lett. 118, 083001 (2017). M. Sabbar, et al. 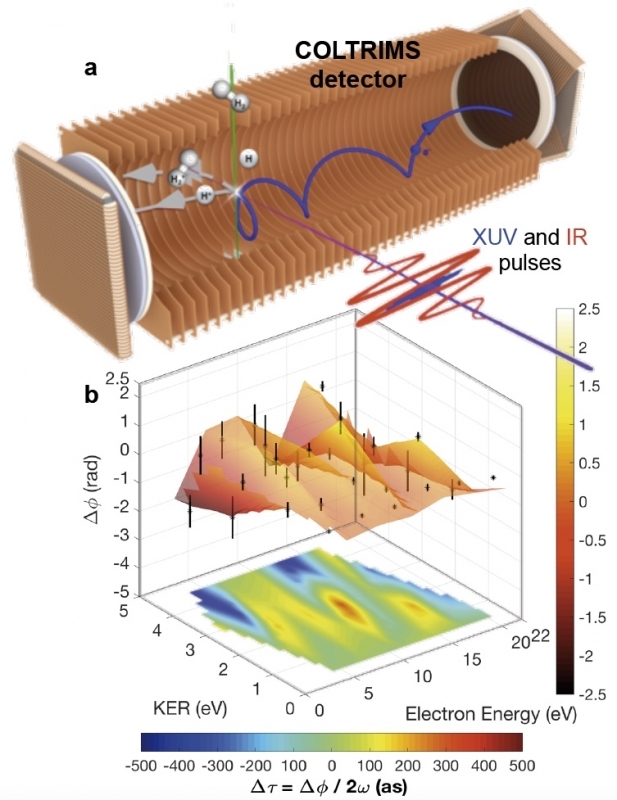 , “Combining attosecond XUV pulses with coincidence spectroscopy,“ Rev. Sci. Instrum. 85, 103113 (2014).